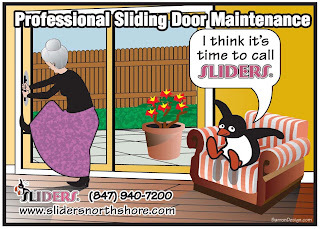 Millions of homeowners struggle every day to move the sliding door accessing their patio, deck or pool. Their sliding doors have not been easy to open or close for many years. And the recommendations from friends to coat the track with grease, silicone or WD-40 has provided only temporary relief. A lubricant would help if the doors really did slide, but they don’t. Sliding patio doors, produced by hundreds of different manufacturers since the middle of the last century actually roll on wheels. These “rollers” are hidden in the bottom horizontal frame of the door. The rollers (wheels) are typically made of zinc coated steel. (A few can be stainless and some are made of a hard nylon) There is an area near each corner in the bottom (metal or wood) frame of the door for each roller assembly. Each assembly consists of a housing, at least one wheel, a bearing assembly and usually a height adjustment screw. The dimensions of the housing, diameter of the wheel and mounting style can be unique to a specific brand of door. There are hundreds of different roller assemblies and wheel diameters that can range from 3/4″ to over 2″. The number of wheels and their diameter is usually related to the size and weight of the door. The lubricated bearings, which carry the load and allow the wheel to rotate smoothly, will wear over time. When the bearings gradually become worn, the wheels begin to drag… making the door harder to move… little by little. As the bearings become worn, homeowners, who have enjoyed the use of their sliding patio door for at least a decade or more, hardly notice the gradual resistance and drag in the door’s operation and have come to accept that this is the way the door moves… as it appears to have always moved this way. In reality, the correct solution is to just have the roller assemblies replaced. It can take a professional less than an hour (under ideal circumstances) and, when the new roller bearings are properly lubricated, the door can be moved in either direction with one finger. It is recommended that roller assemblies be replaced every twenty to twenty-five years. Unfortunately, finding a qualified professional who has access to the specific replacement rollers for your door can be frustrating. Local home centers carry just a few styles and many obsolete assemblies may require some creative retrofitting. 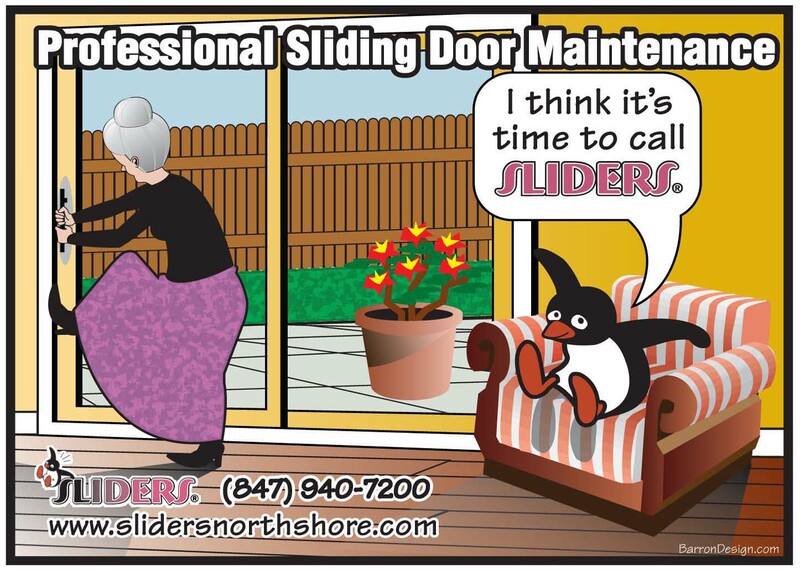 If your sliding patio door cannot be moved with one finger in either direction… the movement is noisy or the track displays gouges… you most likely need your rollers replaced. Other factors can affect your door’s operation and will be discussed later. There is seldom a cost-effective reason to replace an entire sliding door system when simple maintenance can address all issues.